As I move into the final months of my pregnancy, I find myself experiencing the same feelings that I did each time we've grown our family. Every time, there's been an intense desire to get everything ready as we prepare for this new life to join our family. There's a tenderness toward the world, my children, and life in general that I'm normally not as in touch with. Can I admit that I heard the song "Butterfly Kisses" when I was out one day and it nearly made me cry? Good grief - that has got to be a new all-time low. I read a blog post suggesting that the poor here have it good, and I thought about the babies in the population that I work with and I cried. It literally kept me up most of the night. Sometimes when I go to work and hold these babies, there's a heaviness, an ache that I feel. I offer up a silent prayer for them while they sleep on my chest. I pray for hope in situations that often feel so hopeless. Then there are the emotions associated with my own children. I talk with Dan late in the evening, when our children are all tucked into bed, about how much I want to protect them from the ugliness of the world, protect their innocence for as long as I can. How what he and I have is so amazing and how much I want that for them someday. How I hope we are raising them to love God and to express that love in service to others. At the same time, I am so grateful for the moments I have with them right now. There's a part of me that wishes that we could just freeze time and stay here forever. Of course, life doesn't work like that. As children grow, relationships change and blossom and grow, too. There is a beauty that comes with that. With every passing year, I find myself more grateful for the way my relationship has changed and grown with each of my children. Yet I want be here fully to not miss a thing. 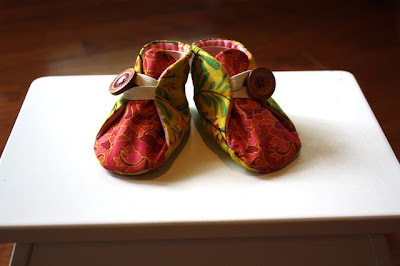 I was sewing one day and realized that a day will come when I won't have little ones to sew for anymore. It's such a blessing to be able to make these tiny creations. Currently, I am continuing to make projects from Handmade Beginnings. I love this book. It's not just for newborns, either. 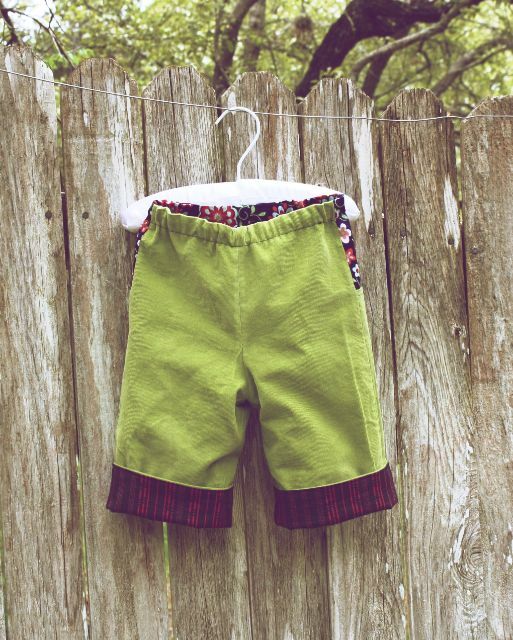 Almost all of the patterns can be made up to the 18-24 month size. In fact, next week, I plan to sew a dress for Evie based on a pattern from this book. Here's what I've been working for the littlest member of our family. 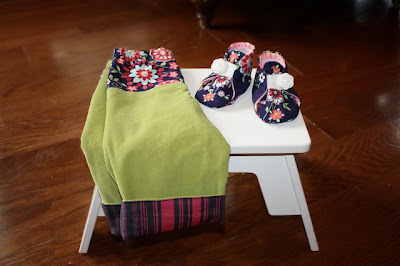 For the booties, I used one of Anna Maria's quilting cottons from one of her older lines. I lined them with her flannel, which is utterly amazing. There's cotton batting sandwiched in the middle, so baby's feet are sure to stay warm. These ever popular Quick Change Trousers are reversible. 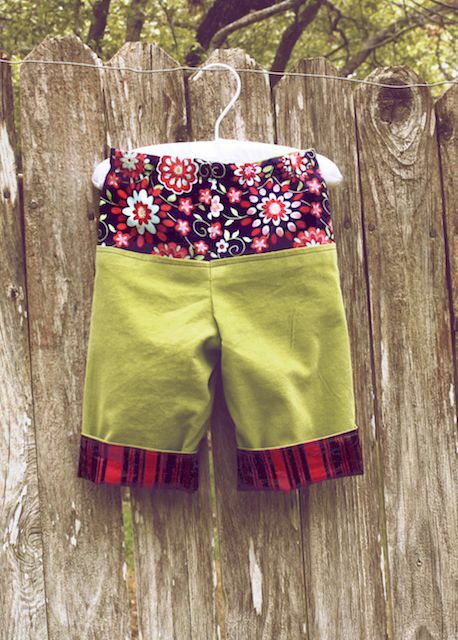 I used corduroy on one side and lined them with some of Anna Maria's voile. The fabric on the upper back side is from Amy Butler's Love line. All of these fabrics were already on my shelf. Unlike the murkiness of the emotions that I wade through as we prepare for our daughter, creating and 'nesting' are straightforward, concrete, and light. Perhaps that's the best part of experiencing the two together.